This song, by the Alaska String Band has been replaying over and over in my mind for the last week since my roommate first played it for me. All religious language of God and Jesus aside here (I am not a religious person in any sense of the word), it’s as if my inner one wanted me to hear this when I tried to take my life two and a half years ago. She wants me to hear this now, to comfort me, and reassure me, and help me heal from that time. I’m not sure where she ends and my higher power begins. She and my highest self are the same. This was her voice, steady and unwavering, and which I couldn’t hear. It’s as if she is singing it to me now, telling me how much she loves me. She takes my hand, and tells me she is there, has always been there, and will never leave me. She will never stop singing this song to me. This is her voice now and always. Categories: 12-step recovery, internal gems, post-its, therapy | Tags: higher power, inner child, self-love, soul, Spirituality, Suicide | Permalink. In Sandra Maitri’s The Spiritual Dimension of the Enneagram: 9 Faces of the Soul, I found this stunning description of love; but it does require a small amount of pre-amble. In the work of the Enneagrams, the term Holy Idea refers to an experience of reality; it has NOTHING to do with religion. Another way of describing the concept of the Holy Idea, in my own words, might be ‘Universal Human Experience of Reality’. 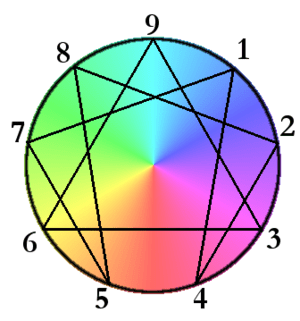 There are 9 of them, which correspond with the 9 points of the Enneagram, which represent 9 dimensions / patterns of human experience. While many online descriptions of the Enneagram types read much like horoscopes or astrological descriptions of personality, Maitri’s book describes the dynamics of the inner psyches and life patterns of each type, with specific reference not only to the personality, which is described by Maitri as being the outer-most level of consciousness, but also to the Soul and the Spirit. Categories: external input, therapy | Tags: enneagrams, love, point 9, psychology, Psychotherapy, sandra maitri, Spirituality | Permalink. My dbt (dialectical behaviour therapy) group was talking about two subjects today that I find myself still talking about tonight. The first was willingness vs. willfulness, where willfullness is the resistance we come up with to avoid change and trying new things. There was a true or false question: T or F — A person who is willful is trying to be argumentative and difficult on purpose. The answer of course is false, that there is deep and old pain and trauma in our resistance that is demanding to be heard. That to say that a willful person is trying to be difficult is not a compassionate or at all effective stance to take. The ability to shift our expectations of a person or situation to see what is, instead of what we think should be, accept that reality, release the feelings of anguish. Accept what is by trusting that it is divine right action, guided by our higher power, who is always and forever looking after our highest purpose, greatest ultimate joy and satisfaction in life. I think this definition is still in progress, but that’s it so far. Categories: 12-step recovery, post-its, therapy | Tags: borderline personality disorder, dialectical behavior therapy, higher power, radical acceptance, Spirituality, willfulness, willingness | Permalink. Not being a Christian, I had never heard this popular Christian story. I didn’t even realize it is a Christian story until I looked it up to find a link to this book. I conclude that it may be inspired by the Christian story, but it is not written in that language, and seems to tell a story of humanity and any higher power or spirituality or personal growth or revelatory experience. It honors all those who have felt forgotten and unworthy, hopelessly and forever cursed. It helped me to see myself; it spoke of something I hadn’t put to words. This is a short story from the book ‘Angels & Dragons‘ by Molly Wolf. The other women would have come early in the cool of the day, chattering companionably as they let down their water jars into the well. Here she is at noon, alone except for the quiet dusty man sitting on the stonework. She is doing this hard, heavy work in the heat of the day, when everybody else is indoors having a siesta. She is here at noon because if she came early, with the other women, she’d have to endure their looks and comments. She has enough to do coping with the steady running commentary from the monkey of self-blame who sits on her shoulder, the beast invisible to all but her, who natters incessantly at her, chewing away at her. She doesn’t need any outside commentary. So she stays away from the other women, because there’s nothing like that look in a respectable woman’s eyes to make another woman feel like a piece of garbage. Her history isn’t recorded in any great detail, so we don’t know what had happened to her. Maybe she’d simply had a run of terrible luck, like Job before her. Perhaps she’d been repeatedly widowed or repudiated, through no fault of her own — infertility, perhaps, or family alliances coming unglued. That’s what some respectable scholars say might have happened. But the women I know say: Huh. This one’s been around the block a few too many times. She will see in others’ eyes, then, condemnation, or superiority, or the sweet falseness of conventional sympathy, or perhaps fear — people can’t help believing that bad luck is catching; there must be an evil eye somewhere, and what if it chances to glance in your direction? People also don’t know what to do with someone who’s damaged, whether by bad choices or sheer chance. They feel awkward and uncomfortable. They are attracted to the happy and successful, and the happy and successful are not out here drawing water at midday, in this dusty place with the dusty quiet man. So she lives alone in town, with the man with whom she has no rights except the right to be looked down on and held at fault for whatever. And that just makes her lonelier. And that’s where the terrible damage gets done, and it’s all the worse because what’s damaged and dirty is her sexuality, her womanness, where she is most vulnerable and can be made to feel hopelessly unclean. Whether or not she’s done wrong, the sense of wrongness sinks in over time; it seems to seep into her being like spilled lamp oil into wood; it gets so mixed up in the fibers of herself that there’s no way on God’s earth she could ever be cleaned or made whole. She dreams that God, finding no way to separate out her wrongness from her self, will have to burn the two together — that to undo whatever the wrongness is, she herself will have to be sacrificed. At least that’s what she dreams, in nightmares that set her bolt upright beside the heavy man with whom she has no rights, gasping and praying frantically to a God who is absolutely silent. Sometimes, in her own house, when she’s alone, she can think back to when she was young, before it all went wrong. She can remember having been worth something, having had some value; she can recollect when the world was a promising place and what awaited her was a man of her own, a house, children, a place in her world, the honor a good woman can have even in a world that doesn’t honour women. And then it’s not so bad. But sometimes all she can do then is to mourn what she lost — or, rather, mourn what she was never given to lose. You can’t mourn the loss of love if you’ve never been properly loved; you can only mourn the fact that you have never had it to mourn for. But who understands that, except those who have been in the same position? Walking across to the well is when the shame hits her hardest, because she feels most exposed and loneliest then. Her water jar may be heavy, but her sense of shame is heavier still; it always is. Shame is such dense stuff, much, much heavier than mere guilt. Even quite small balls of shame weigh you down, so that you struggle to walk across the village square or climb a set of stairs. It pushes your head down, bowing your shoulders forward, or it makes you walk unnaturally upright, your shoulder blades so rigidly yanked back that they ache, a clench in your upper back, and your molars crunched together. It’s that heavy, shame. So she walks across the dusty square, grim and silent, and there’s this dusty, quiet man sitting on the masonry around the well. There are only the two of them there, although God alone knows how many are watching them from the silent midday houses. It is intensely quiet, only the buzz of insects and the lonely caw of a distant crow. She steps quietly, not wishing to draw attention to herself. After a quick, sideways glance, she keeps her eyes off him. She can see from his clothing that he’s a Jew, not a Samaritan, and she’s down enough already, she doesn’t need his ritual contempt. She fancies he can tell what she is anyway; a respectable woman wouldn’t be out here at this time of day, on her own. She’s had enough put-downs. She’ll just get her water and go before he can lecture her or spit at her or just give her one of those looks. But his voice, listing her past that he could not possibly know about, stays as kind and level as it had been. He is still talking to her, not naming and blaming the wrongness, but simply telling her that yes, he already does know about all that stuff, and really it isn’t important. Or it’s important because it’s caused her so much suffering, and he knows about the suffering too, and the guilt and the weight of shame. He knows that healthy hopeful girl who used to be, and he knows that the girl is really who she still is–but he also knows how she got to be where she is now, what choices, what chances fetched her to this dusty place under a merciless sun. But none of this is part of her; she has a self worthy of love. This wrongfulness is like dirt on a mirror; on, not in, the glass. Something that can be cleaned away. He knows. He has really seen her, exactly as she is. And he’s still talking to her. Can’t you see, you people who see only a dusty man and a woman with a water jar talking together — can’t you see that what he is doing is pulling that stain out of her, so that they can both set it down and walk away from it? He is sorting through her self and cleaning the crud out: the old mistakes, the old tragedies, the corrosive self-blame, all the times she’s been found at fault and accepted the fault when in fact she shouldn’t have. He’s picking all that out of her, and he’s telling her that when the wrong’s all picked out, there is still a person there, a real person, as valuable and beloved as the highest priest in Jerusalem–a woman of Samaria, who should have had it so much easier. He is looking her in the eyes now and telling her that she exists, outside the wrongfulness she thought was part of herself, as much her as the shape of her hand. And if he’s right, if the wrongfulness isn’t really her, then maybe it doesn’t have to rule the rest of her life. Maybe things can be different. And yes, there is living water. She knows now what it tastes like. Categories: 12-step recovery, author's picks, external input | Tags: athiest, drinking, God, healing, inspiration, Inter-Faith, Mourning, recovery, removing the stain, Samaritan, Shame, Spirituality, universal | Permalink. i’ve been devouring this book, sent to me by a dear friend who knows how to listen to her intuition. Discovering with unlimited empathy the ways people are human, we become the person we would hope to be. (…) Both Shakespeare and archetypal psychology take their power from their capacity to reveal what we all know, if we were only to think openly enough, about the fundamentals of human life. If we could live from that deep place of recognition, we might allow ourselves the beauty of our eccentricity and tolerate in others their efforts to find their souls in the odd collection of emotions, fantasies, and behaviors that form the raw material of a human life. We go on living when meaning fails and when we don’t get it right. We go on in the presence of mortification, a word that means simply “death-making,” and we become who we are destined to be as much through the death-making as the life-making. Success and happiness are impossible without the continuous nudge of death. Living through our mortifications is the coupon for vitality and the ticket home. Fame and achievement may not be our destiny. It may be sufficient to be here, to open our hearts, take in what is offered, make our contribution at whatever level is granted, and gracefully depart. In any case, I am not the one who should be worried about the planning, for each life seems to have come equipped with its own tempo and timetable. Modern psychology tries to tell us that we are constantly developing creatures, but I prefer to think of us as seasonal beings. We have our summers of sunny pleasure and our winters of discontent, our springtimes of renewal and our autumns of necessary decay. We are essentially rhythmic, musical. As the ancients used to say, our emotions are in orbit, like the planets. Patterns that define us return again and again, and in these returns we find our substance and our continuity, our original nature and our identity. 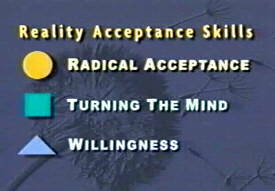 Categories: 12-step recovery, external input | Tags: Archetypal psychology, Arts, creativity, eccentricity, human, Original Self, Paradox, radical acceptance, soul, Spirituality, Surrender, Thomas Moore, universal | Permalink. 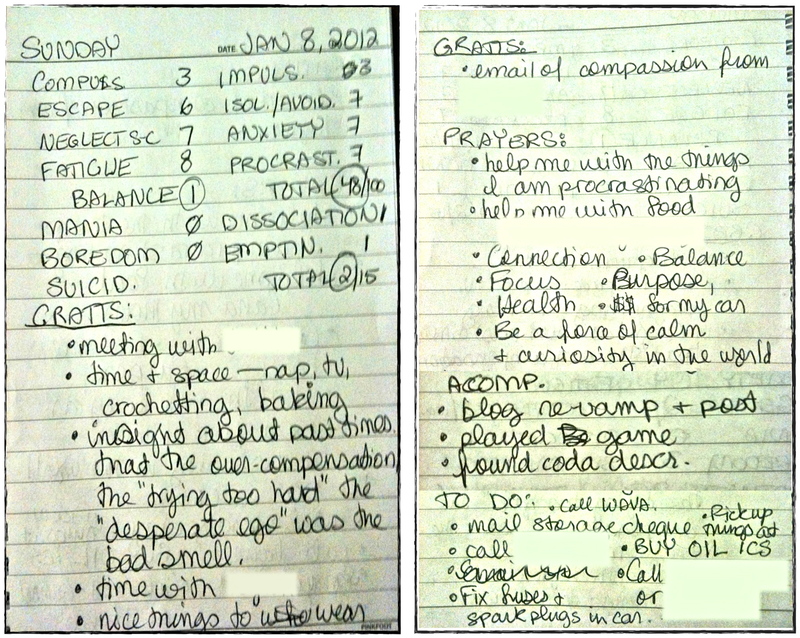 Inspired by the diary cards used in Dialectical Behavior Therapy, as well as notes and techniques from a dear friend of mine with several years of intensive trauma therapy on me and a diagnosis of PTSD; I began using diary cards, and posted an earlier version, in December (still and always a work in progress). General Rating: Rating these aspects helps me to recognize how i am feeling and know when i need to call on my supports or tools of self care, or simply ask myself why i am feeling this way. 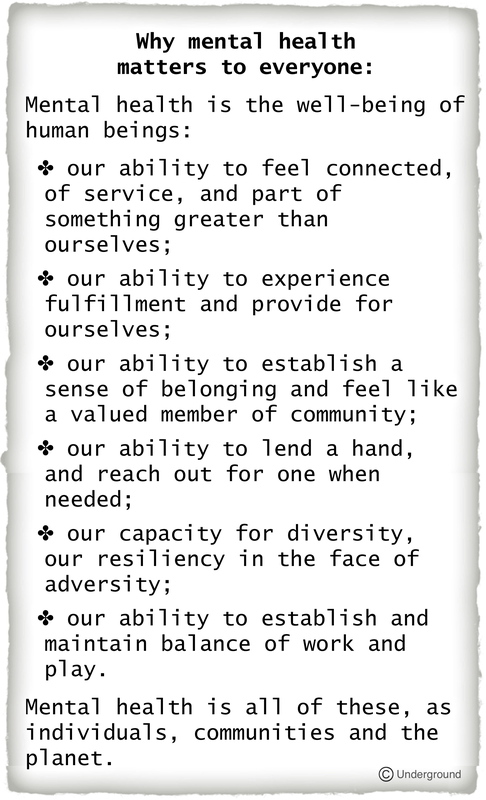 Grattitudes: Listing the things I am grateful for reminds me that there are things to be grateful for, helps me remember the good parts of my day and the revelations I have had that affirm that I am growing and making progress. Prayers: Writing down my prayers is becoming a way to connect with my authentic self – what she wants, what is in her heart, making her feel heard. It also reminds me that I don’t have to overcome things alone and I can ask for help. it develops a sense of faith in life and resiliency in myself, that I am not helpless no matter what is happening. 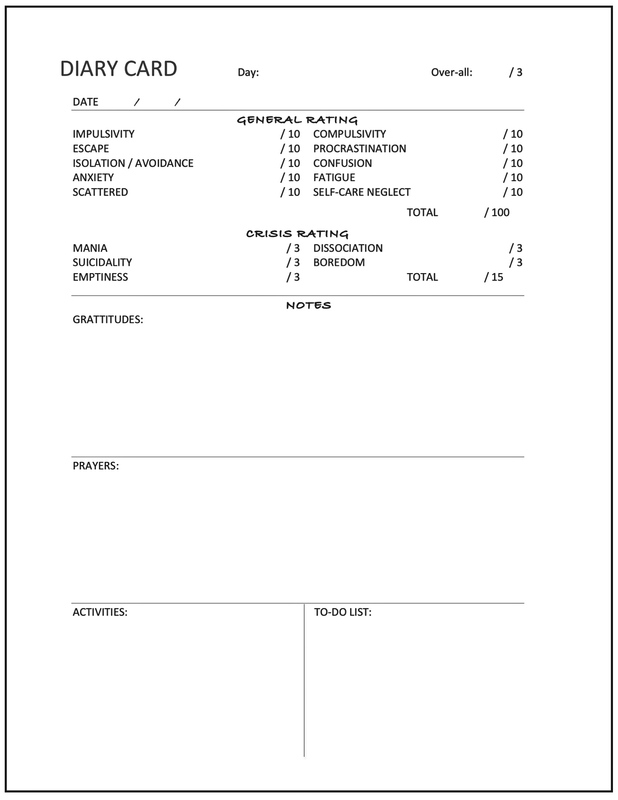 Activities: Listing the things I have accomplished in my day, or how I spent my time helps me develop and maintain a sense of purpose and validates my day. It can alleviate the feeling that my days are slipping away and i have no idea what i have done with the time or any sense of moving forward. I don’t just list productive things here, in the traditional sense of the word; but anything that i found worthwhile in terms of joy, connection, fulfillment, growth, healing or satisfaction. To-Do: Listing all the things that are on my mind to do helps free my mind space and relax me, knowing I have a list so I don’t have to remember everything that needs doing. It also helps to focus me in my day when i read it the next morning. Overall, I find that diary cards are a dose of validation and self-identification – who am I, what drives me, what are my strengths, what is in my heart, and how am I really doing. They are a reminder of the things that are most important in life, which are also the things that are easiest to forget — the things my recovery friends and I know to remind each other of if we are not in a good place with ourselves and the world. this is a big part of my spirituality. 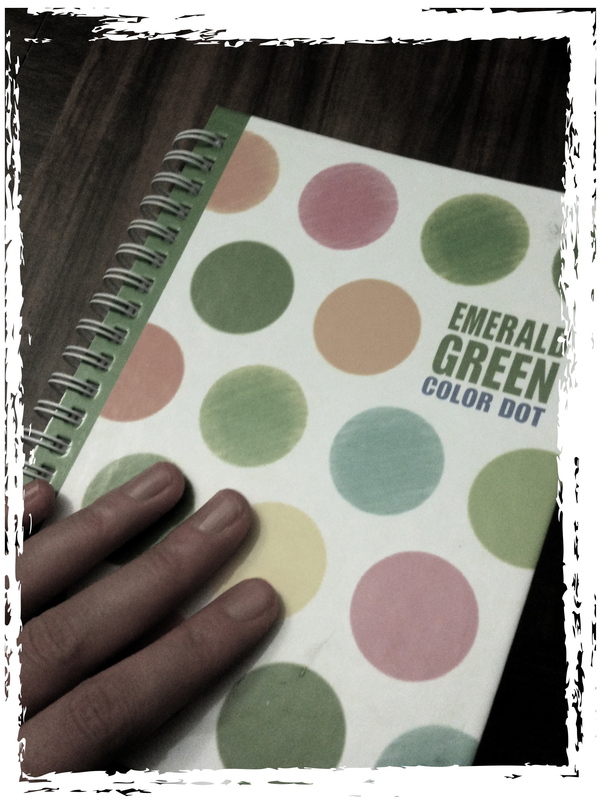 Do you journal or record your day in some way? 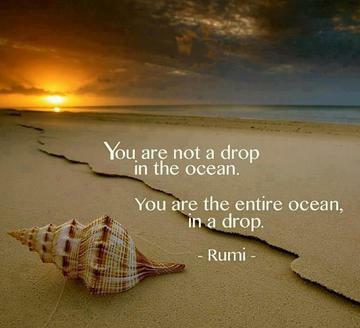 What is spirituality to you and how does it help you? 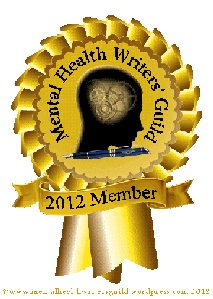 Categories: 12-step recovery, author's picks | Tags: 12-step recovery, borderline personality disorder, dialectical behavior therapy, diary card, grattitude, healing, identity, Mental illness, quiet bpd, recovery, Self care, Spirituality, Therapy | Permalink.